The Brisbane central business district (CBD), or 'the City' is a suburb of Brisbane, Queensland, Australia and is located on a point on the northern bank of the Brisbane River. The triangular shaped area is bounded by the Brisbane River to the east, south and west. The point, known at its tip as Gardens Point, slopes upward to the north-west where 'the city' is bounded by parkland and the inner city suburb of Spring Hill to the north. The City is bounded to the north-east by the suburb of Fortitude Valley. The City is laid out according to a grid pattern surveyed during the city's early colonial days, a feature typical of most Australian street patterns. As a general rule, the streets aligned northwest-south east are named after male members of the House of Hanover, while the northeast-south west aligned streets are named after female members. Queen Street was the central roadway, that was turned into a pedestrian mall. It forms the pivotal axis for the grid of roads within the district. Brisbane is the state capital of the Australian state of Queensland and is the largest city in that state. Brisbane is named after the river on which it sits. 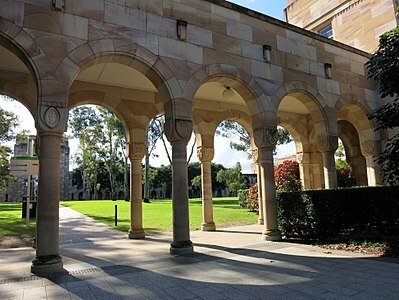 In 2016, Brisbane was classified as a beta world city by the Globalization and World Cities Research Network operated out of Loughborough University. Approximately 1,000,000 US troops passed through Australia during World War II. The city has retained some heritage buildings dating back to 1820s. Brisbane City Council is the largest local government body (in terms of population and budget) in Australia. The Port of Brisbane is the 3rd most important port in Australia for value of goods. Brisbane is the third-most popular destination for international tourists after Sydney and Melbourne. This is a suggested list. You can edit it, or discuss changes to it here.